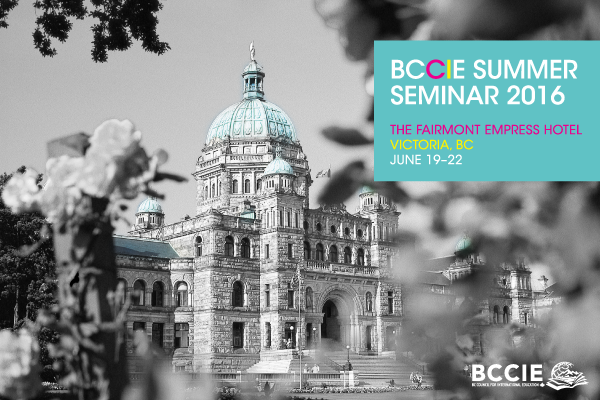 Our 7th annual Summer Seminar will be held at the Fairmont Empress Hotel in Victoria, BC from June 19–22, 2016. This year's conference theme will be An Agent of Change. Summer Seminar provides an essential platform for the growth of BC’s International Education sector. BCCIE’s annual conference brings together over 300 participants from our province, across Canada and beyond our borders. The conference attracts senior leaders, researchers, practitioners, student service providers, administrators, government, NGOs, and students to explore these ideas with the aim of strengthening our work and taking steps towards advancing outstanding leadership in the fields that comprise International Education in BC. Don’t miss Summer Seminar in Victoria, from June 19–22, 2016!